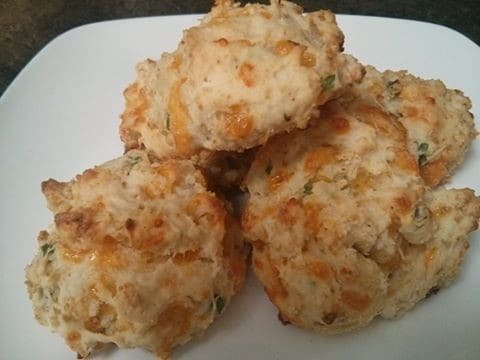 I’ve tried just about every cheese biscuit recipe ever written, and always thought they were just OK. These use yoghurt to make them incomparably moist and soft, and the spices give them a bit of kick and just enough “je ne sais quoi” to be worth making again. In a large bowl, sift together flour, baking powder, and baking soda. Stir spices into floor to combine, then add melted butter and mix until mixture resembles coarse crumbs. Add the green onions and cheese and mix to coat. Make a well in the center of flour mixture and pour in the milk and yoghurt. Stir as little as possible, just too barely combine. Drop batter by big spoonfuls onto a parchment-lined baking sheet – makes about a dozen biscuits. Bake in preheated oven for about 15 minutes, until lightly browned.